Buying and Selling Silver Golden Age Comic Books... Top Dollar! We are Buying and Selling Silver Golden Age Comic book Collections… Top Dollar Paid! We Buy and Sell Comic Books. Top dollar paid for Bronze, Silver and Golden Age comics. Comic Book are a field of collection that require very specialized knowledge to accurately assess value. Chad Busby, the owner of Busby Antiques, has worked in this area of collecting for over 32 years, and has that knowledge! What are the cover prices on the comics? Ten cent and twelve cent cover prices are the oldest (referred to Golden Age and Silver Age comic books, respectively), and the odds of having a more valuable comic in the collection goes up. Condition is very important. Are there any creases in the covers? Tears? Do they look like they could be brand new off of the newsstand? Generally speaking, a comic with just a few creases on the cover is in Very Good condition, and is worth about 20% of Near Mint value. Remember, the combination of condition and age is what drives rarity! Key issues and important titles are what drives demand. Early Marvel and DC Superheroes are in very high demand. Early Archie’s and War Comics are generally not as collectible, but there are of course many exceptions. A key issue is typically a first appearance of a character. So, if you take the first appearance of an important villain in an important series, (such as Amazing Spiderman #14, the first appearance of the Green Goblin) you have a very high demand, high value comic. Add in high grade like VF (very fine) or better, and you have a real winner! So, if you have a box full of 10 cent cover price Batman comics that look like they were barely read, you could be sitting on a gold mine! Give us a call for a personalized assessment of your collection and a cash offer to purchase. 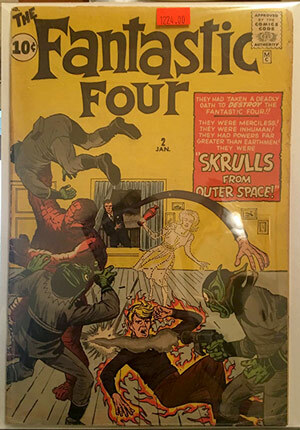 Have Key Bronze, Silver or Golden Age Comic Books collections to sell?